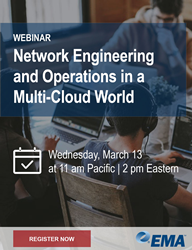 Enterprise Management Associates (EMA), a leading IT and data management research and consulting firm, today announced it will host a research webinar titled “Network Engineering and Operations in a Multi-Cloud World,” featuring Shamus McGillicuddy, research director of network management at EMA. Enterprise network engineers and architects are essential to cloud transformation. As companies migrate applications to the public cloud, network teams must assess networking requirements, specify policy, recommend architecture, establish connectivity, monitor costs, and assure performance. However, the tools and processes that network engineers and architects have relied upon for decades are designed for a pre-cloud world. Today’s hybrid and multi-cloud architectures require network infrastructure teams to transform themselves. Cloud Networking Assessments: How do enterprises assess the networking requirements of applications migrating to the cloud? Hybrid cloud and multi-cloud connectivity: How do enterprises establish this connectivity and what challenges inhibit their success? Cloud compliance: How do network teams support cloud compliance? Cost management: How do enterprise monitor and manage cloud networking costs? Cloud network assurance: What data do network teams collect? What tools are delivering value? Where are their blind spots? Management tool strategies: Are incumbent network management tool vendors addressing enterprise requirements in the cloud? Do native monitoring solutions offered by cloud providers offer value? Founded in 1996, EMA is a leading industry analyst firm that specializes in providing deep insight across the full spectrum of IT and data management technologies. EMA analysts leverage a unique combination of practical experience, insight into industry best practices and in-depth knowledge of current and planned vendor solutions to help clients achieve their goals. Learn more about EMA research, analysis and consulting services for enterprise line of business users, IT professionals and IT vendors at http://www.enterprisemanagement.com.